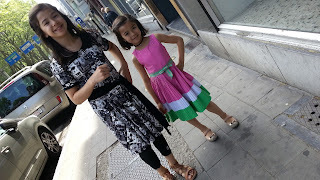 A dress project for my eldest daughter for her to wear on Saturday (28 May) it is their school feast, (and oh the other girl here on the photo is my youngest daughter but I didn't make her dress, how I wish I did :-).) 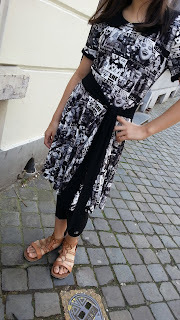 And so the teacher required her or them to wear black dress, but the thing is I have few blacks or better yet not literally all black fabrics and this one that I've sewn for her is the best choice. Anyway it will be worn one time only and at the same time I am on a thrifty mode then I didn't opted to buy new fabrics but it seems like her teacher wasn't happy with the choice I made for her. Oh well, next time I will buy what is being asked even if I am on thrifty mode! Fabrics are from my stash, pattern is from www.pattydoo.de - Marylin, it is a peplum but I made it as a dress and added a belt sash. I used black fabric for the peter pan collar and belt sash because I have some as left over just to have a touch of black.